Welcome and thank you for attending Face of Winter. Register or log in to receive your deals. If you registered last year, click here to log in as a Returning User. No need to register again. Your username is the email address you used to sign up. Code Format: None of the 2018 coupon codes include the number zero. The letter "O" is a valid character in your code. PLEASE include the dash in your coupon code after the first four digits. Follow this format: DEN-12345. Limit one voucher per person. Coupon void if sold or transferred in any way including websites. Sale or purchase of a coupon is illegal and seller/purchaser are subject to legal action. If you are registering children & family members, you will need to create a unique account for each person. Questions? Please email wmefeedback@aimmedia for the fastest response. If you need to call the office please allow for the 2-3 business days for a response. Call (303) 253-6486 , Mon-Fri, 9am-5pm (MST). Proper ID required for redemption. Children under 13 can use a parent or guardian's ID for verification. Choose an ID type that you will present with Coupons. 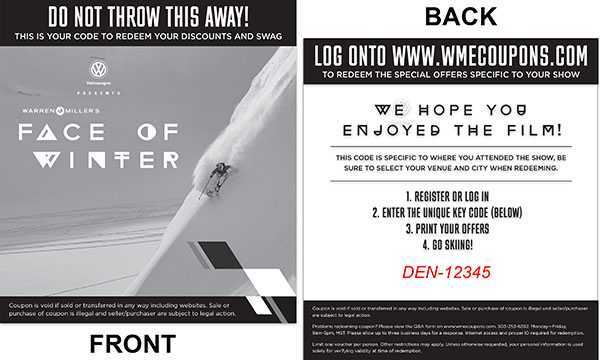 WME Coupons gives Warren Miller moviegoers access to receive special offers designed specifically with the Warren Miller fan in mind. At each participating film screening, attendees are issued paper tickets imprinted with a unique key code. Film attendees can then register their code and download coupons for great offers like lift tickets, sporting goods discounts and vacation deals.